On the day after Thanksgiving, the Boys headed North for a set of scrimmages in Bangor. Goaltender Charles Henry Watson ’22 had an impressive debut and his Freshmen teammates also played very well as Coach St. Pierre had his first look at a number of players. 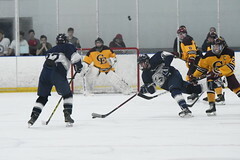 In the opening game, Yarmouth cruised to a 3-0 win over Hampden Academy with Watson recording the shutout. Kurt Heywood ’19 scored two goals and Sam Marjerison ’19 picked up a single tally. 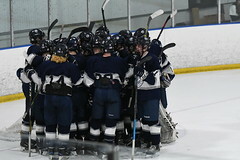 Yarmouth failed to generate offense in the second game and fell 2-0 to Presque Isle, which included an empty net goal. In the final game, the Clippers struggled against Class A Bangor in a 5-1 loss. 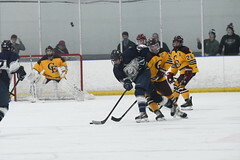 Sam Marjerison registered Yarmouth’s only goal on a nice back-post pass from Will Geise ’20. The Junior Varsity team opens its season on Friday, November 30th at 8:05 pm when they take on Greely at Casco Bay Arena. On Saturday, December 1st, the Varsity squad will travel to Norway Savings Bank Arena in Auburn to take on Class A Edward Little High School in their only regulation, pre-season contest. Game time is 6:30 pm.